Buko Pandan Salad with Pandan Ice Cream. One Pinoy sweet salad dessert is the classic Buko Pandan Salad. The recipe goes back to our grandparents where the only source of gulaman gelatine come from Agar Agar bars. Agar Agar is gelling agent from a kind of seaweed. Today we now have the options of the Agar Agar in easy to use powder form. Buko Pandan Salad is not new to OPC in fact it was one of the initial recipes when OPC was starting, just click the link Buko Pandan Salad. 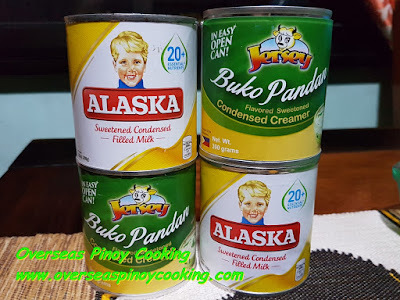 The recipe may not be that perfect compared other Buko Pandan recipes that have are no available in the web. But that recipe was one of the more popular post during that time. 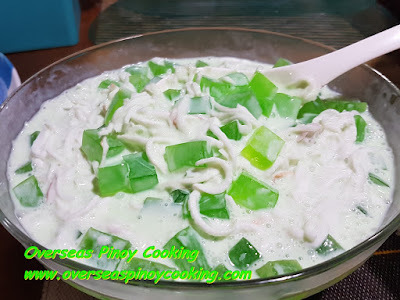 Today I want to share a level up version of the classic Buko Pandan Salad. Buko Pandan Salad with Pandan Ice Cream. The dessert is brought to the next level by the pandan ice cream topping. This level up version recipe is also dead simple, it only requires minimal ingredients that are already available in most supermarkets. 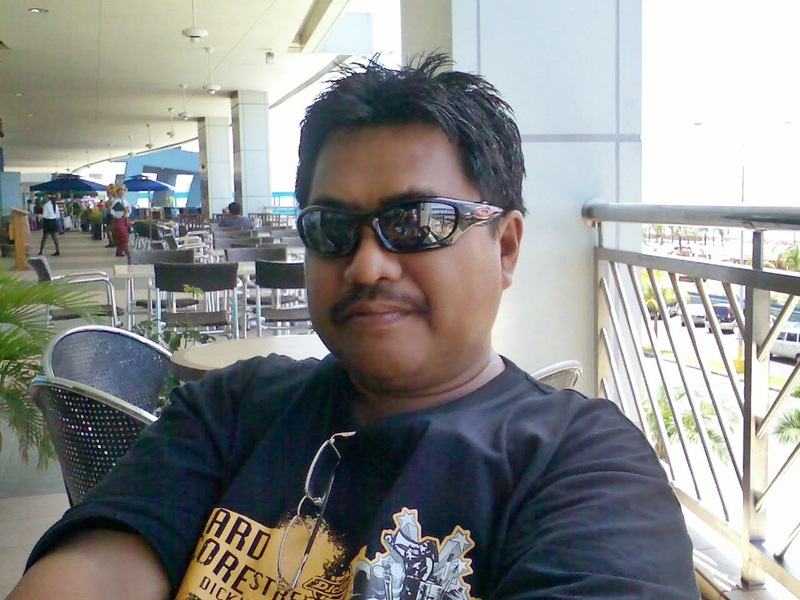 Offcourse the buko need to be bought from a buko peddler. 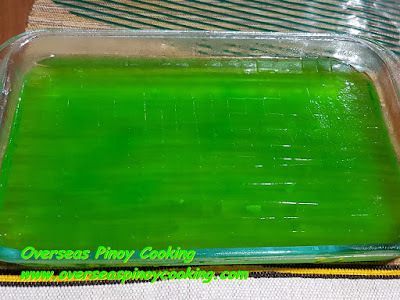 The only hard part is the making of the pandan gulaman where it involves boiling the gulaman solution and letting it set to gelatine and ultimately cutting in to cubes. 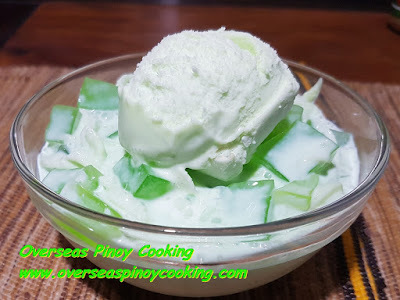 Buko Pandan Salad with Pandan Ice Cream is definitely a winner but wait for next post for my innovative and out of this world Buko Almond with Vanilla Ice Cream Salad. Check out also other similar Pinoy sweet salad recipes, just click the link list below to see the post. Okey here is the recipe of my now improved Buko Pandan Salad with Pandan Ice Cream, try it, it’s dead simple to make. In a medium sized sauce pan dissolve the unsweetened pandan gulaman powder in 1 liter of water, ratio as per package instruction. Bring to a boil and simmer for about haff minute. Now pour the gulaman solution in a wide shallow container, let cool and allow to set, Cut gulaman into 1/2” cubes, set aside. I a large bowl combine the buko strips, gulaman, condensed creamer, condensed milk and about 3 to 5 drops of pandan essence. Let chill in a refrigerator until ready to serve. Serve with vanilla ice cream topping.